When you’ve got to work over muddy, rough, and rocky conditions, just strap a pair of steel tracks over the wheels of your Bobcat loader and get going when the going gets tough. These genuine Bobcat attachment pieces provide reduced ground pressure under your loader and add the element of floatation, allowing you to move over any type of rough and rugged surface with ease. When moving over soft ground, the steel tracks add much needed traction to your wheels, and they operate much better than rubber tires, adding an element of protection from damage and natural wear and tear. Your Bobcat loader is tough, but with the Bobcat steel tracks attachments, you can work under any condition. You’ll never be limited in your work because of harsh operating environments. Instead, you’ll be able to glide over the most rugged terrain with ease, able to get any job done. The specially designed open bar and side plates improve the uptime and performance even more. Once the initial installation is done, the steel tracks can easily be installed again using Bobcat’s patented installation tool in less than a half hour. When you want to take them off, removal of the tracks can be done in just 10 minutes. As with every genuine Bobcat attachment part, the steel tracks come with a one-year warranty and the option of taking advantage of Bobcat’s superb service options. Just look for the Bobcat Brand symbol and you know that you’ve got a quality product you can trust. 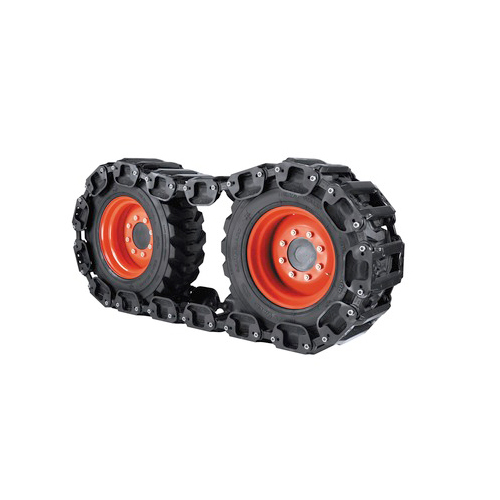 Improve performance in rough, rocky, and muddy conditions with steel tracks. Designed for Bobcat loaders, steel tracks provide better flotation and reduced ground pressure when operating in tough environments. And when working in soft and loose conditions, steel tracks also work to improve traction. Compared to rubber tires, steel tracks deliver better operating results while also protecting tires from wear and damage. Get better results without limiting potential job sites and operating environments by using steel tracks. Length Adjustment: Built-in for optimum track attachment. Open Bar Design: Built for improved performance, the open bar design utilizes the tire to provide maximum traction and flotation. Open Side Plate: When working in tough and muddy conditions, the open side plate allows excellent cleaning in the pivot area, providing better uptime protection. Quick Installation & Removal: After initial installation, steel tracks can be installed in less than 30 minutes or removed in less than 10 minutes. Replaceable Bushings: Bushings are replaceable and hardened for optimum operating results. After initial installation, steel tracks can be reinstalled in less than 30 minutes. Using a rope or chain, tracks are easily pulled over the tires by backing the loader slowly. Always refer to the complete installation instructions prior to installing tracks. Reduces the time and effort required to connect the track ends, delivering better installation results and more time spent on the job. Included with each set of steel tracks sold. Look for the Bobcat brand to verify the steel tracks are the correct fit and function for the loader.